Robert Venosa - ARTE AMAZONIA provides a global voice through art for the indigenous cultures of the Amazon. and is represented in major collections, including those of noted museums, rock stars and European aristocracy. He studied painting technique with Mati Klarwein in New York, and Ernst Fuchs in Vienna, both of whom are proponents of the Misch Technique (also known as the Master's Technique) discovered by the seventeenth-century Flemish masters Hubert and Jan Van Eyck, which utilizes the system of painting in tempera and oil glazes. This technique is perfect for painting the crystalline worlds that Venosa envisions: Light goes through the surface oil glazes, bounces off the white tempera underpainting and comes back out hitting the eye with the illusion of transparent depth. evolving the uniqueness of his work. including ayahuasca which puts him at the forefront of Ayuhasca Visionary artists. Venosa passed away in 2011 at the age of 75, leaving his wife (and compainion artist) Martina Hoffmann, and us with his visionary visions of art. 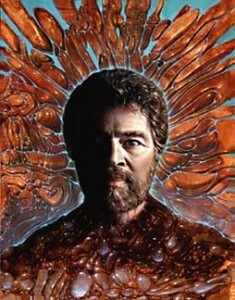 Much of Venosa's work has been published in his books, Manas Manna, Noospheres, and most recently, Illuminatus, which features the text of Terence McKenna. His art can also be seen on a number of CD covers, including those of Santana, Kitaro, and Ornette Coleman.